Tahini (Arabic tahina) or sesame paste is a paste of ground sesame seeds used in cooking. North African/West Asian tahini is made of hulled, lightly roasted seeds. 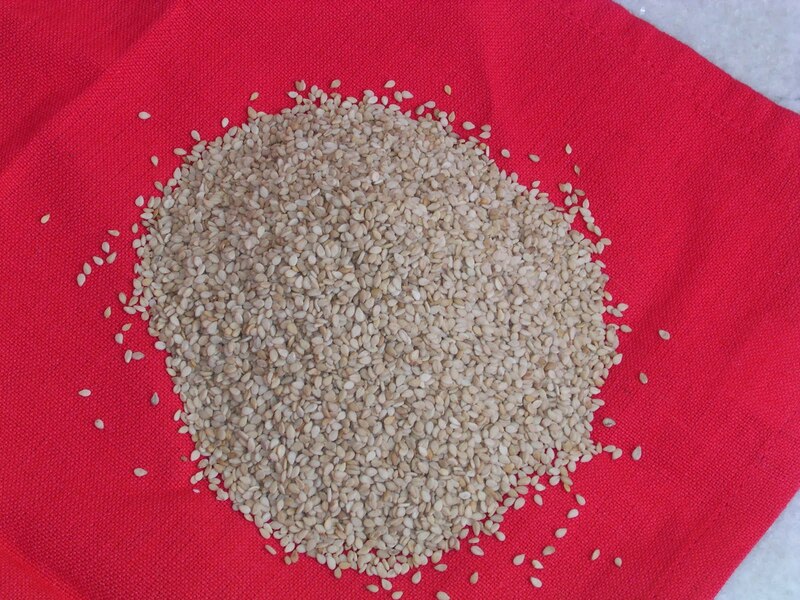 East Asian sesame paste is made of unhulled seeds. So that explains the brown colour of my tahini. Tahini is a major component of hummus and other Middle Eastern foods. It is sold fresh or dehydrated. 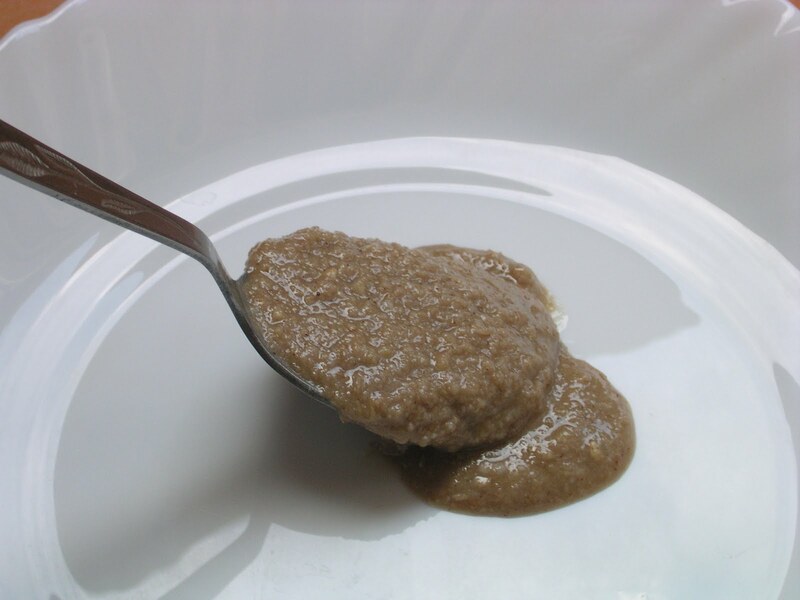 Sesame paste is an ingredient in some Chinese, Korean, and Japanese dishes; it is used in some versions of the Szechuan dish Dan dan noodles. 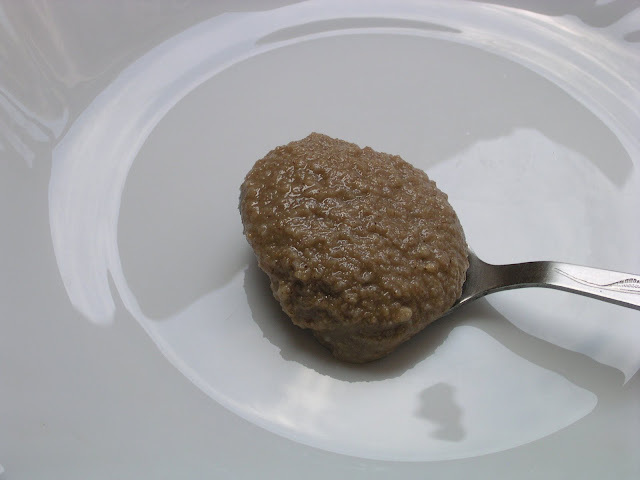 Because East Asian sesame paste is made from unhulled seeds, it is more bitter than tahini. I have added honey to my tahini, so it can be used as a spread on toast, or as a sandwhich for kids. Sweet tahini can be used as you would use peanut butter. good source of calcium, magnesium, iron, phosphorus, vitamin B1, zinc and dietary fiber. Sesamin has also been found to protect the liver from oxidative damage. Microwave or toast the seeds for 30 seconds. Add oil and pulse till you get a paste. oh wow I love this in eggplant hummus and have never seen it made homemade your a genious going to bookmark this one love it thank you!!!!!!! Shirley, I'd love to try this with bread. Looks yummy! wow..i never thought of making tahini!!! this is great! I've only ever used tahini in hummus and tahini-yogurt sauce but I love the idea of using it, with honey, as you would peanut butter! Yum. Oh so simple! It's on my list for this weeks must try items. Thanks for sharing it with us. Simple to make, and much cheaper than buying by the jar, I'm sure. Love the nutrition information! i great way to make home tahini!thanks,shirl! I just made black sesame paste.... so yum! Shirley... you are such a fun mom and are making so many good memories for your children! I love homemade tahini... and it is awesome on rice crackers too drizzled with raw honey! Never thought to make tahini before, but this totally makes sense. It's easy too! I love the addition of honey in your fantastic homemade tahini! Oh! Will have to try to make myself next time :-) Thanks! Great post about Tahini! :) It's a delicious ingredient in so many Lebanese dishes, both sweet and savoury. You should try it with traditional grape molasses and bread... YUM! A Blackforest and your Wishes!